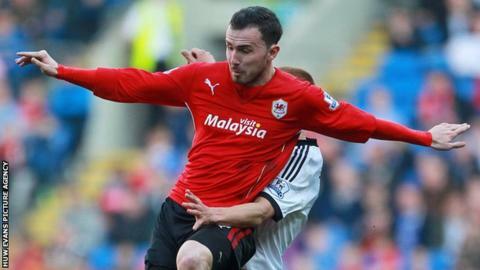 Cardiff City's Jordon Mutch says the Bluebirds are confident of maintaining their Premier League status after Saturday's 3-1 win over Fulham. The ex-England Under-21 midfielder set up Cardiff's second goal as Ole Gunnar Solskjaer's side climbed to 18th, level on points with West Brom in 17th. Manager Solskjaer says his side need to win four of their last nine fixtures. "Who's to say we can't win six or seven of those games, with the confidence we've got at the minute?" said Mutch. "We've always had that belief. Two to three weeks ago, we always knew we could get out of it. "This is just one result so let's not get too excited. I think we've just got to take it one game at a time." The Bluebirds are only in the relegation zone on goal difference and still have to play teams in and around them in the table. Their next match is at seventh-placed Everton on Saturday. Cardiff held Roberto Martinez's team to a 0-0 draw earlier in the season. Mutch has been impressed with the job the Spaniard has done at Goodison Park since taking over in the summer, but hopes City can at least repeat their result against the Toffees. "I think they are better this season under Martinez. I think they play a lot better football," said Mutch. "Hopefully we can combat that and get something out of the game. "We've got some good players in the squad, so they are not short of confidence as it is. "But winning creates a good habit, so hopefully we can take that into next weekend. "We'll go there and look to get three points."